Getting started with Arduino is a snap. 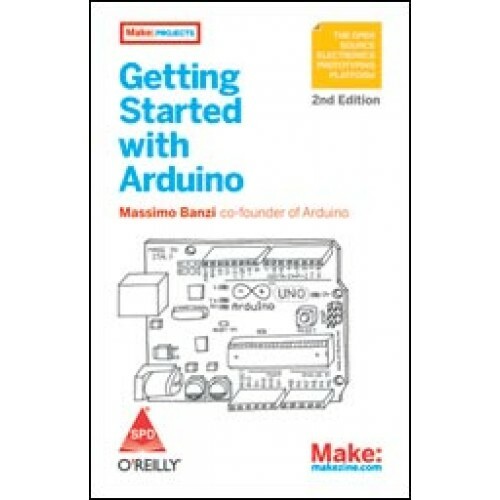 To use the introductory examples in this guide, all you need anArduino Uno or earlier model, along with USB A-B cable and an LED. The easy-to-use Arduino development environment is free to download. Join hundreds of thousands of hobbyists who have discovered this incredible (and educational) platform. Written by the co-founder of the Arduino project, Getting Started with Arduino gets you in on all the fun! Massimo Banzi is the co-founder of the Arduino project and has worked for clients such as: Prada, Artemide, Persol, Whirlpool, V&A Museum and Adidas. He spent 4 years at the Interaction Design Institute Ivrea as Associate Professor. Massimo has taught workshops and has been a guest speaker at institutions like: Architectural Association - London, Hochschule f r Gestaltung und Kunst Basel, Hochschule f r Gestaltung Schw bisch Gm nd, FH Potsdam, Domus Academy, Medialab Madrid, Escola Superior de Disseny Barcelona, ARS Electronica Linz, Mediamatic Amsterdam, Doors of Perception Amsterdam.